Runners get a chance to run in the “Valley of the Mastodons” at the annual late winter running of California’s Diamond Valley Lake Marathon, Half Marathon & 5K, which takes runners along the edges of the Diamond Valley Lake reservoir. This man-made water reserve that has served Southern California’s water needs for more than six decades and has also been the site of many paleontological fossil finds, including mammoths and mastodons whose origins date back to the Pleistocene era, which spans the time period from roughly 1.8 million years ago to about 10,000 years ago. 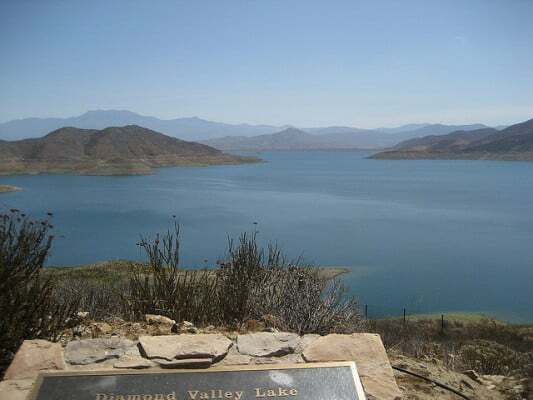 Today, the 4,500-acre reservoir that now lies between two mountain ranges in the valley is home to some of Southern California’s and the Inland Empire region’s most sought-after recreational fishing, and draws serious anglers for both cold-water and warm-water fishing. The lake’s East Marina serves as the starting and finish lines for the marathon, the half marathon and the 5K, which begin at 8:00 AM, 9:00 AM and 9:30 AM, respectively. From the marina, those running the half marathon will follow what amounts to an out-and-back route along the northern edge of the lake, on a course that features many twists and turns along the winding route along the lakeshore. With the exception of the stretch near the half-way point in the race, the course features some slightly rolling hills but overall a largely even course for the 13.1-mile race, along terrain that is made up mostly of hard-packed dirt roads with some loose sand, gravel and rocks along the way. The only paved stretches of the course occur on the saddle dam near the half-way turnaround, which runners cross twice (on the way toward and back away from the turnaround point), as well as some access roads. Other than that, the rest of the course is natural surfaces, and the event is limited to 1,000 participants for all three races combined. Located in Southern California, roughly 90 miles east of downtown Los Angeles, Hemet typically experiences March temperatures between 43°F and 70°F, while rainfall amounts average just over 2.3 inches for the month. See the race route map for the Diamond Valley Lake Half Marathon here. To reserve your spot in the 2019 running of Hemet’s Diamond Valley Lake Marathon, Half Marathon or 5K race, register online at Active.com here. Ever run in the Diamond Valley Lake Half Marathon? Share your impressions here, or post your review in the Comments below.